Q1 : Why is the study of the origin and growth of sociology important? 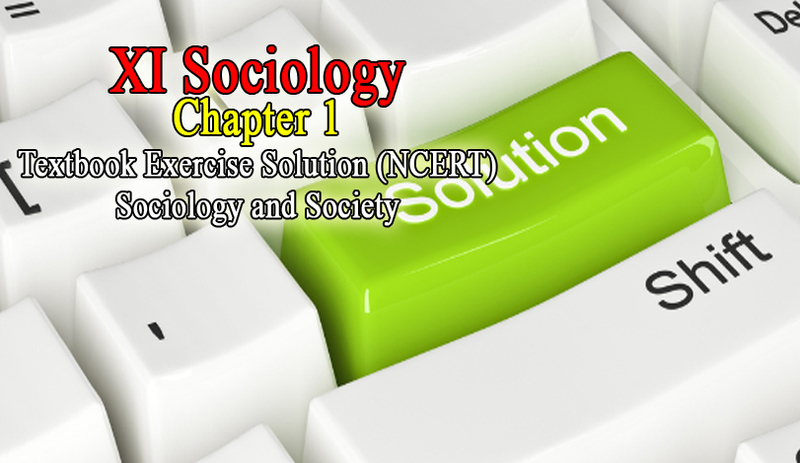 Sociology is the study of social life of humans, their groups and societies. The subject matter ofsociology is our own behaviour as social beings. It is important to study this subject, in order to understand the society as a whole. Hence, sociology helps us in the understanding of interconnectedness of the social systems across. It is important to study the origin and growth ofsociology because it helps in shaping the subject matter according to its principles and perceptions. The study of the origin of the subject also helps us to understand the ideas that led to its origin. Sociology studies societies that are different in size, characteristics, etc. by using certain methods, material contexts and methodologies. The study of growth of sociology shows the new ideas that were involved in making it a distinct subject of social science. These ideas which were gradually involved in bringing up this subject affects its subject-matter. Therefore, studying the origin and growth of sociology is important to understand the various institutions and their functions present in the society. Q2 : Discuss the different aspects of the term 'society'. How is it different from your common sense understanding? (i) Pre-modern societies such as, hunters and gatherers, pastoral and agrarian and non-industrial civilisations. (ii) Modern societies such as the industrial societies. Sociology studies society on the basis of some rules and principles that depend on concepts, data and methods. On the other hand, our common sense understanding of the society depends on our naturalistic or individualistic understanding. Common sense knowledge does not question its own origins but Sociology has both the systematic and questioning approach that is derived from a broader tradition of scientific investigation. In our common sense understanding of the society, the aspect of the term 'society' is very limited which is quite different from that of sociology. Q3 : Discuss how there is greater give and take among disciplines today. (i) Sociology, as a subject studies the society in the form of social behaviour, social institutions, social policies and programmes that get affected from the historical, political and economic policies. (ii) Political Science studies the polity of the country. The political atmosphere, political policies, etc. have an impact on society and its economy. Sociology has shared common interests of research with political science. Political sociology focuses mainly on the study of political behaviour of the various institutions and their interactions. Studies have been conducted to understand sociological reasons for support of political parties, the role of gender in politics, the process of decision making in organisations, etc. (iii) The economy is the subject matter of economics that studies economic activities, economic policies etc. that gets affected by political policies and the needs of the society. The economic behaviour and activities are looked upon through sociological approach in a broader context of social norms, practices, values and interests. Also, the subject of economic sociology has been introduced, because of the wide and critical perspective of both sociology and economics. (iv) History as a subject has been different from sociology. However, the historians nowadays have started using sociological methods and concepts to understand the social matters, gender relations, customs and other important institutions of the past. (v) Psychology is the science of behaviour. Society gets affected from individual behaviour in collective form and even the individual behaviour is affected by the society that makes sociologyand psychology interrelated. This has introduced the subject of social psychology, which studies the primary interest in the individual by observing his/her behaviour in social groups. (vi) Anthropologists study simple societies whereas sociology studies complex societies. Social anthropology and cultural anthropology are of concern for sociologists. Anthropology is often regarded as the sister discipline of sociology. Polity, economy and society are interrelated and get affected by each other. Therefore, these three subjects are necessary to be studied together. Hence, the different disciplines of social sciences such as anthropology, economics, political science, history and psychology are interrelated as they share common interests, concepts and methods. Q4 : Identify any personal problem that you or your friends or relatives are facing. Attempt a sociological understanding. My uncle and aunt are looking for a groom for my cousin. They are looking for a boy who is well-qualified, government officer, decent and has a good family background. However, my cousin wants a well-natured husband who might not be a government officer. She is looking for someone who would provide her freedom to pursue her career and allow her to live the way she wants to. Her family wants a government officer who can make them feel socially and financially strong. They also want the boy to be of same community because of social pressure, but my cousin wants a loving husband irrespective of his community background. In the above example, it is clear that personal choice is often affected by one's individual needs and thoughts. The girl holds a modern thinking and does not believe in the barrier of caste or community to find a soul mate. Her views are shaped with the changing environment of her work place and peer group. On the other hand, her parents are affected by their community and feel the pressure from the society to find a son-in-law who belongs to their own social group. The views/opinions of the parents mentioned above are formed by the pressure of society and the wish to have a government officer as their son-in-law arises from their own need. Therefore, we can say that our needs and opinions or views are formed by the various institutions of society, such as work places, peer groups, etc.